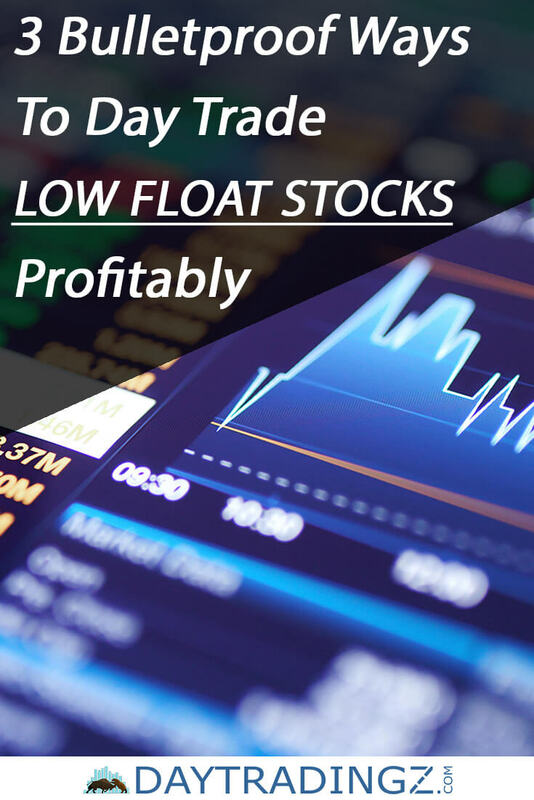 Low float stocks are a subject of great interest for day traders as they are a very good tool for earning continuous profits throughout a single trading session. Due to the fact that low float stocks are very short numbered, they tend to go up and down in price very easy and quickly. The increased level of volatility makes them a perfect investible opportunity for day trading and especially market participants with the potential to trade in huge volumes. Low float stocks are very common and widely popular instruments, present in all markets worldwide. Let's find out how to day trade low float stocks for profits. How to find low float stocks? Low float stocks are the stocks of companies with pretty high institutional ownership that are left for trading on the market. For example – if a company has total outstanding shares of 100 million and the restricted stocks (also known as closely-held) are 90 million, it means that just 10% (10 million) of all shares are low float stocks and are available for public trading. Usually, companies issue closely-held stocks which are owned by major stakeholders, employees or other insiders. The minority left for public trading (usually 10% - 15%) are low float stocks. The fact that low float stocks are usually a very small number, makes them prone to higher volatility. This, on the other hand, serves as a good opportunity for day traders. Due to the frequent price movements of up to 100% and the potential for higher returns. Low float stocks are traded multiple times in huge volumes throughout the trading session. For example – a stock with a low float of 500 000 shares will change its price way faster when compared to a stock with a float of 10 million shares. While the price of the first can be easily influenced with less buying power, it is way harder to move the price of the instrument with a bigger volume. Another characteristic of low float stocks is the fact that the bid/ask spread is quite wide. After you are aware of what low float stocks are, it is time to find out where to find them. Low float stocks are available for trading on a variety of platforms. How to scan for low float stocks with TradeIdeas? If you are not familiar with what TradeIdeas is, make sure to check the in-depth Trade Ideas review here. 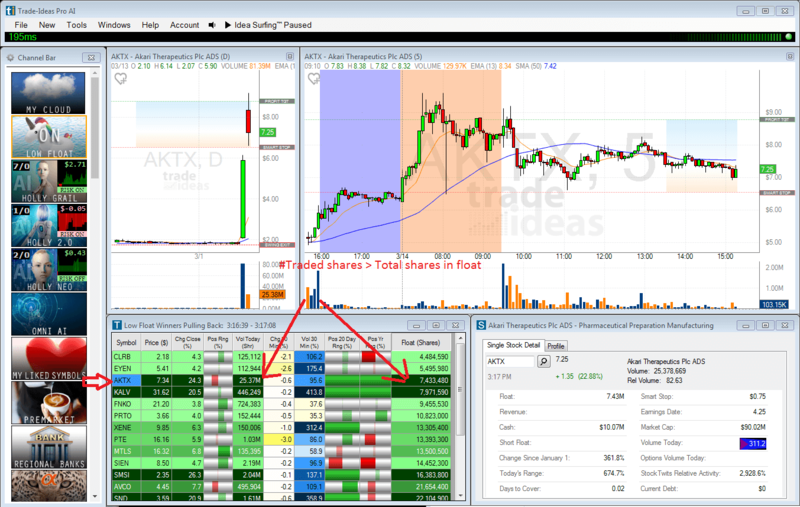 Trade-Ideas is a great stock scanner to find and trade low float stocks. Although it also does not have any ready-made scanner for low float stocks, it can easily be adjusted to filter the instruments with the biggest potential to make a notable price move. 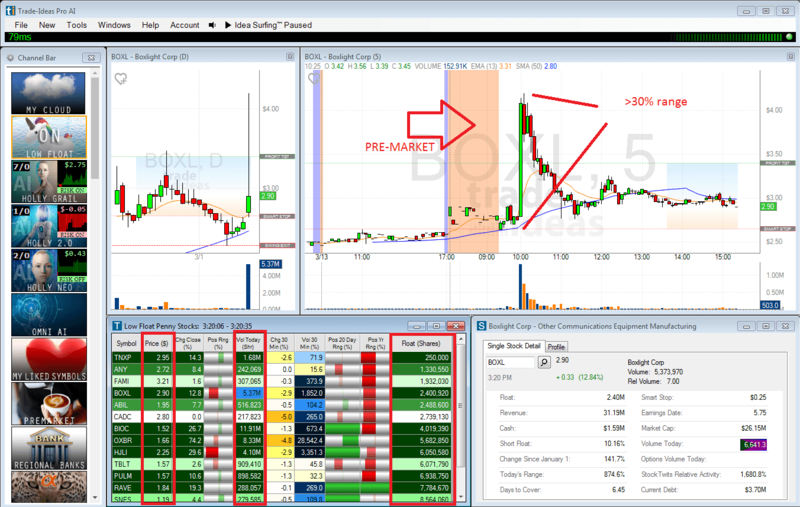 In order to do that, use TradeIdeas Stock Scanner filters and alerts. 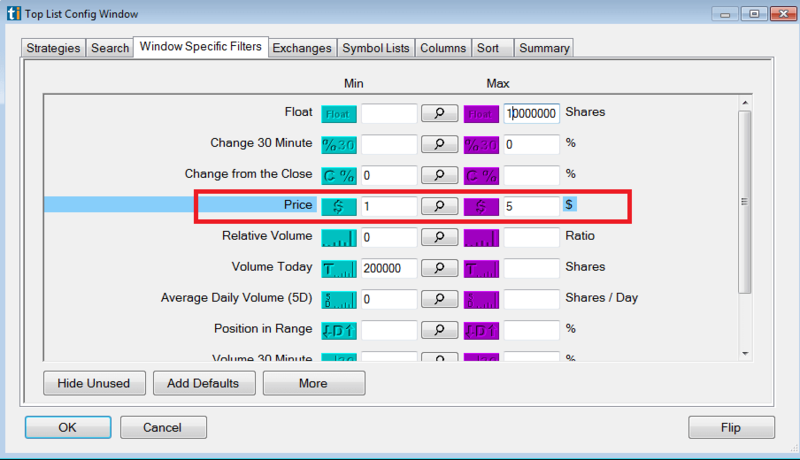 By filtering the list by volume, gap % and float, you will be able to narrow down your stock search to the best 15 or 20 instruments with the highest abilities to make intraday price moves. Another useful way to find highly-potential instruments is to filter the stocks with a low float of less than 50 million, as well as high relative volume and gapping below support and above resistance levels. 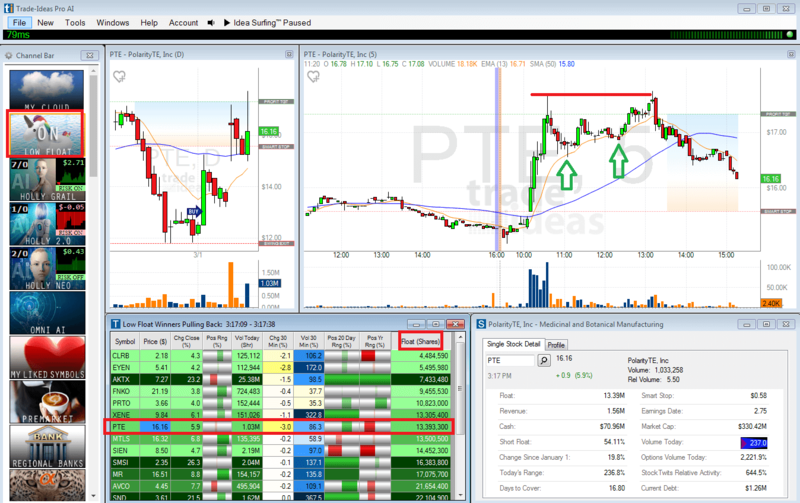 For less than $3 a day, you can use Trade Ideas as your favorite low float stock screener. Alternatively you start with the free stock chat room Trade Ideas provides. How to find low float stocks on thinkorswim? As one of the leading trading platforms, thinkorswim is used by millions of traders on a daily basis. However, it is worth noting that the platform does not have a built-in scan feature to help you find low float stocks for trading. This means that as a day trader if one wants to find low float stocks on thinkorswim and trade them, he should invest in a third-party add-on or check the criteria of the best stock scanner. You can search for low float stocks manually as well, although it will take you significant time, looking at corporate earnings reports and analyzing documentation. 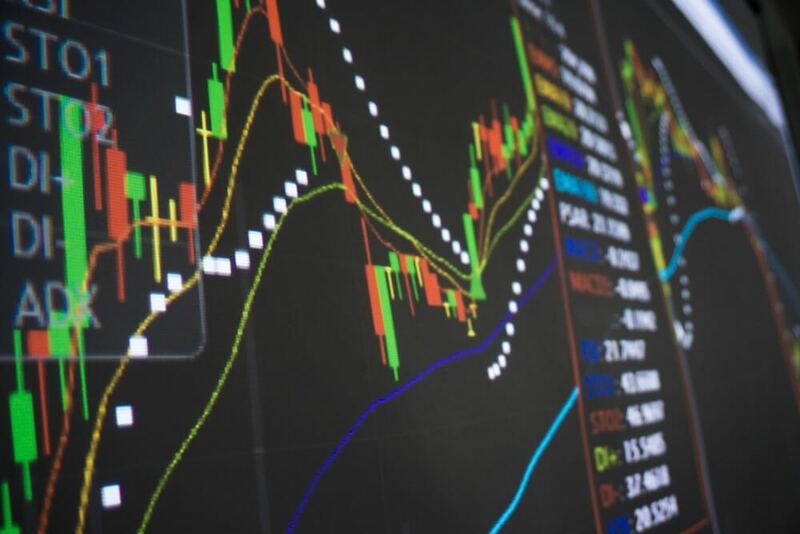 When considering day trading low float penny stocks, the important thing is to focus on finding common stock patterns by using technical indicators such as SMA, RSI, MA convergence/divergence and many others. ​​To filter penny stocks, you can choose a price range of your choice. As an example $1-$5 dollars. But to trade low float penny stocks successfully, one needs to consider one other characteristic as well – the volume. ​​BOXL has only 2.4mn shares in float and 5.4mn traded stocks today. The orange is the pre-market. The news caused the significant move. The stock never made a new high! The lower supply of low float stocks makes the trading volume of the particular instrument a very powerful indicator for potential price movements. Biotech companies are among the most popular low float stocks as the industry is highly profitable and renowned for its potential of sudden price booms (a consequence of a scientific breakthrough, FDA and patent approvals, etc.). The high volatility makes low float biotech stocks a great opportunity for day traders to profit from. The website offers a variety of tools, as well as plenty of informational resources, such as FDA approval calendars, IPO schedules, biotech watchlists, etc. ​In Trade-Ideas you can set up your own biotech-stock watchlist. Just create a new one, chose a name and you are ready to go. You can import biotech indices stocks or whatever stock list you like. 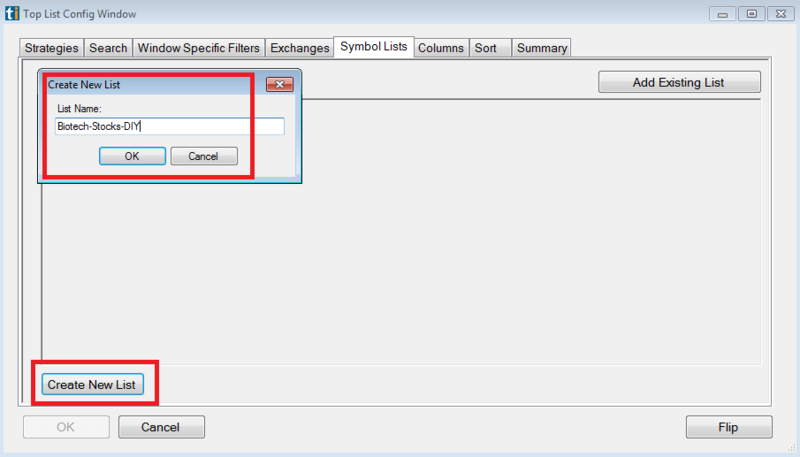 This way you can filter to show only alerts for biotech stocks. Day traders who prefer to take advantage of ready-made watchlists, instead of customizing their own can use some of the resources, available on the web. What is considered a low float stock? A low float stock is considered one with a relatively low number of shares, available for public trading. Low float stocks are prone to higher volatility and price instabilities, which makes them a preferred instrument for day traders. What is the float of a stock? The float indicates the number of shares available for public trading. The float is calculated by subtracting restricted stocks from the company’s total outstanding shares. The float is important for investors as it gives them an indication about the possible volatility and profit potential of the particular instrument. What is a good float percentage? It depends. Every trader has his own perceptions on what is a good float percentage, depending on the characteristics of the preferred trading strategy. However, most industry professionals consider a float percentage as good when it is in the range of 10% - 25%. Trading low float stocks is not an easy task as it requires lots of attention and continuous monitoring of the open positions. If you are not ready to lose money, do not start with low float stocks. Due to their high volatility and instantaneous price swings, these instruments are capable of wiping out one’s portfolio in a matter of minutes. However, equipped with the right tools and ready to run nightly and daily scans will mitigate the risk of unexpected losses. While at the same time low float stocks increase your chances of taking advantage of the huge profit opportunities. Make sure to start each trading session with an initial pre-market scan to see which stocks have moved during the night (and are currently reacting to news events)​. Do the same after the closing bell of each trading session to find out the main movers and add them to your watchlist for the next day. And most importantly – do not forget to use low float stocks for day trading only and avoid leaving any open positions overnight!